More Lovin' Than I've Ever Had: Who's a doll? Chaotic Bliss makes me happy. 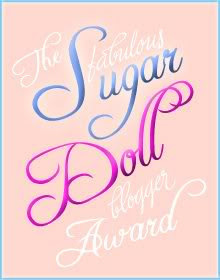 She gave me the Fabulous Sugar Doll Blogger Award! 1. I always have a hairtie (or two) on my wrist. 2. I have a rubber ducky collection I plan to use in my future childrens' nurseries someday. 3. I over use exclamation points, elipses, and sometimes adjectives. 4. I learned graphic design through an interneship and F&M and fell in love. 5. I work part-time as a florist during the holidays. 6. I have 5 tattoos and am hoping for more. 7. I am working on writing my first book. It's a memoir of sorts. It terrifies me. 8. One of my favorite things to do is wrap presents. 9. Karaoke will forever remain a pasttime for me and I plan to somehow incorporate it into our wedding. 10. At work a stuffed liger keeps me company at my desk. And now, some bloggers I think are worthy of this award. Just note, these are in no particular order - but they're all super awesomely amazing bloggers!! Awww. Thanks Alisha! I love that you have a rubber duckie collection. Thanks so much for the blog award! So thoughtful. My daughter also *always* has a hairtie or two on her wrist...drives me nuts! I take them off her in her sleep :) Do you want to come over and wrap Christmas presents for me please? Awwww... my ego thanks you! I cannot believe you read (or anyone really) reads me. I know everyone says that but it is true. In my case. Seriously. p/s. I love wrapping presents too! Christmas is one of my favorite holidays because of it. Loves it. pp/s Who are you on WB btw? Well, I'm 23. I was going to Franklin & Marshall for Creative Writing. And I found an internship there doing design. And fell in love. So I decided I want to design book covers. And I will. One day. I live in my grandmother's old house, have rubber ducks taking over my bathroom, and always wear a hairtie on my wrist. If you're gonna read my blog - expect to see alot of exclamation points, an overuse of adjective, and elipses. There'll be ton on my boyfriend. Somehow we met. Somehow we fell in love. When we were both trying to do the opposite. I love him, he loves me. We're lucky if we have a car between the two of us at any given time. We're a mess and we like it that way. Now we just gotta shout it on the mountain tops.